Iron Horde Invasion: RE IMAGINED! As you all know, I found the ‘Iron Tide’ pre-expansion event more of an ‘Iron Puddle‘. While I totally appreciate Blizzard spending the time to make a pre-expansion event, this one was just… eh. However, its much more fun to look at the positive than critique the negatives, so I’m taking this opportunity to stretch my creative writing muscle. What follows is the Iron Tide pre-expansion event, re imagined FUSSYPANTS style! Upon accepting the quest (it would also be auto-accept), you are instructed by the quest to take the portal by the portals trainer to the Blasted Lands. The portal dumps you somewhere near the two fortresses and you head to the keep. You find Nethergarde Keep/Dreadmaul Hold damaged and on fire. Alliance/Horde forces are desperately trying to repair the fortress, and signs of a battle are everywhere. Lots (but not all) of friendly NPCs are dead or dying, and there are orc bodies and orc machinery scattered about. It appears that your fort was attacked, but no one is entirely sure by whom. The Alliance think it is the Horde, which the Horde has honestly no clue. You offer your services, and complete a few quests dealing with clean up, and then the leader of your respective fort sends your out on a scouting mission. You are to find where those filthy orcs went to. Following the trail of the attackers, you come to the Dark Portal. Only, this isn’t the Dark Portal. The thing is swirling an angry red instead of it’s normal green. The Alliance and Horde camps that were there are in total ruins, and there is more of that strange machinery lying around. You notice a few Iron Stars too. 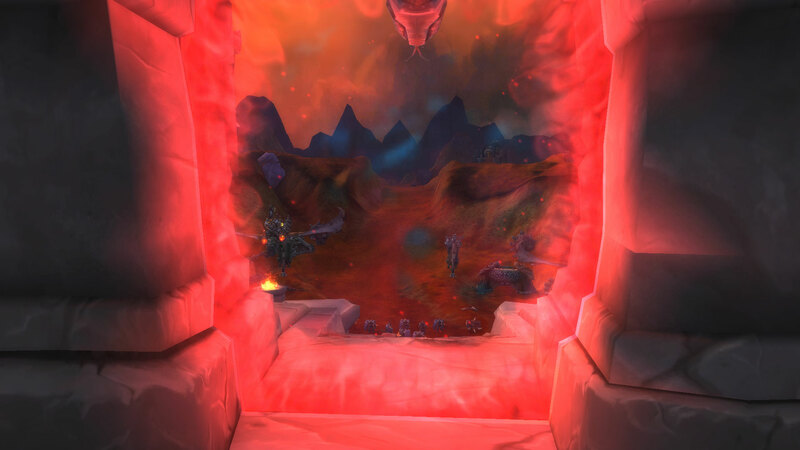 You decide to go through the portal (rather, a quest suggests it), but as soon as you approach, Khadgar appears out of no where, and tells you to get out out of here as fast as you can. “They are coming again! It happens again!” He keeps telling you, but you aren’t quite sure what he means. All the same, you two retreat to a safe distance. You cut to a cinematic. The portal starts to swirl more vigorously, the red deepening. Then, (with dramatic music and a zoom in) orcs start to pour out of the portal. There are hundreds, no thousands of them! Then, comes machinery and Iron Stars, so very many! A particularly nasty looking orc steps out, and the camera zooms in on him. He smirks, and then the cinematic ends. Khadgar, upon seeing this, turns into a raven and flies off to ‘send warning’. You decide to head back to the Keep, but you have to kill a certain amount of orcs on the way (sort of fighting your way to the camp). Flying isn’t disabled per say, but the skies are teeming with Iron Horde and flying too close to them will dismount you. You are restricted to leap-frog flying but mostly on foot. You arrive at your Keep, and it is just chaos. The proverbial poop has hit the fan and everything is nuts. Iron Horde are everywhere, bombs keep going off, supplies are falling from Iron Horde in the sky, everything is burning and everyone is fighting. The majority of the mobs are elite, but will only attack if you attack first (aren’t neutral mobs, just preoccupied with fighting). A frantic battle for survival. Now, this is where the questing would get interesting. Instead of normal questing, objectives would pop up sort of like a scenario. Phasing would be minimal, you would just be able to interact with different things depending on which objectives you are on. And no, it would not be instanced, so you could see other players and even group up if you wished. The first objective would be to kill a certain number of orcs. You would get a buff so that you could take down these elite orcs without getting slaughtered. Next, you would be sent to find the leader of the keep. Upon finding them, you would then be sent to get rid of Iron Horde champions and commanders in charge of the battle. At this point the phase would change, making for less friendly NPCs, more orcs, and a more destroyed fort. The next objective would be to find three friendly NPCs and bring them to the tower where your leader is. This tower is one of the last holding defenses. You find the three NPCs, one of which is guarding a child who got caught in the midst of battle. You and the NPCs make your way back to the safe tower, which is about to be overrun. Your next objective is to repel these attackers. After a few short seconds, the orcs retreat. You then jump to another cutscene. It’s you and the survivors catching your breath after the battle. While the others go to tend to the wounded or guard the entrance to the tower, your leader remarks upon the hasty retreat of the orcs and the fact that they could have won if they didn’t retreat. Suddenly, there is a horrible spinning and grinding noise coming from outside. Everyone freezes, and you pull the child behind you. With a massive crash, an enormous Iron Star shatters through the walls. The cinematic ends with the NPCs beginning to scream and then black…. You awaken to a worried Maraad/Thrall. You are injured (lorewise, not gameplay wise) but very much alive. Maraad/Thrall explains to you that the Alliance/Horde got Khadgar’s message and sent a fleet of ships. The Alliance and Horde combined managed to create a beachhead and sent scouts into survey the numbers of the Iron Horde and the state of Nethergarde Keep/Dreadmaul Hold. The scout found you in the wreckage and brought you back to the camp. You are ‘healed enough to fight’ (again, lore not gameplay), and once again begin questing. You kill more orcs, and then go destroy their siege weapons (similar to the beginning of the questline currently ingame). The scouts have gathered vital intelligence about the enemy and Maraad/Thrall decides its time to strike for the leader (that nasty looking orc from the first cinematic). This part would be similar to the Undercity Invasion event. You, Thrall, Maraad, a bunch of friendly NPCs, and whomever else was on this part of the quest charge in (in a phased environment) and attack the Iron Horde head on. You puncture through their lines, and work you way to the Dark Portal. Once there, you find even more orcs, more than you could ever hope to fight. So, you get in these Iron Star-like things and basically mow them down. This angers the leader, that nasty orc you are after. After an epic battle involving a lot of crazy mechanics (like driving the Iron Stars into the enemy’s incoming Iron Stars), you and your raid finally defeat the orc leader. Triumphant, but not for long! 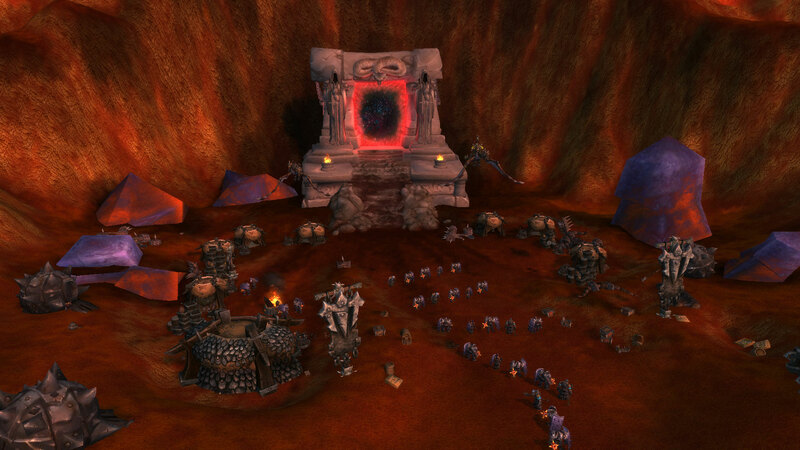 Once more, Iron Horde starts to pour out of the portal. You beat a hasty retreat in those Iron Star vehicles, and make it safely back to your camp. The final quest is Maraad/Thrall telling you to warn the King/Warchief of this new and deadly threat! So that’s what I would imagine for the quest chain. A lot longer, and more actual invasion witnessing. And more danger. The Iron Horde is savage, so the questline would reflect that! And of course, the questline would reward gear like it currently does. Now, this wouldn’t be all to the pre-expansion event. Once you have completed the questline, you can go back and loot Iron Scraps, a new currency just for this event. This currency would drop from any and all Iron Horde forces. At every capital city and in the Blasted Lands too, there would be vendors that sold you gear (similar to the quest gear), transmog gear, an Iron Star Vehicle toy (similar to Yak Fur), or a temporary tabard that will teleport you to the Blasted Lands in exchange for this currency. In addition to all of this max level content, there would also be content for lower levels. Iron Horde Scouts can be found in all leveling zones as a rare-ish mob for leveling characters to defeat. Killing them would yield the Iron Scraps, a sizable chunk of change, and a low chance for the Time Lost Box. However, killing these mobs on a character that far outlevels them (if the number are grey to that character) gives no loot, so you want to kill the Iron Horde forces more you level, and not farm the level 5 scouts. Also, these Scouts will occasionally mount attacks on capital cities. The Iron Horde Scouts will appear all over your city, and you and your allies must band together and find and slay them all. Otherwise, they start killing off NPCs (don’t worry, vendors, questgivers, and trainers are attacked last) slowly but surely. The NPCs would disappear for an hour before respawning. The scouts would be elite 90s, but they would be neutral so lowbies don’t get slaughtered. However, anyone can help take them down, and if you damage them you receive loots. So even a level 5 can help and reap the benefits! UBRS the dungeon would receive a little more explanation for why it exists (Iron Horde that escaped into rest of Azeroth and set up a stronghold in the mountain), and the ending would also have explanation and not be so abrupt. The Iron Horde in the dungeon would also drop Iron Scraps. But other than that, I’d leave it pretty much the same. This event would go on until the dropping of WoD, wherein an ingame email from Maraah/Thrall would say that Azeroth has repelled the majority of the invader, and if the player is maxed leveled, would invite them to come and push the Iron Horde back even farther. Mobs, venders, and currency from the event would disappear, but pets, toys, and gear would not. Patch 6.0: Iron Tide or Iron Puddle? Its been about a week since the patch dropped, which is a long enough time to come up with an informed and not knee-jerk reaction to the changes. So here it is; Fussypants and Yotaan’s responses. Fussypants: To sum up the entire patch experience for me… lackluster. Before I sound like some whiner on the forums though, let me explain. This is what I saw when I first logged in. My poor action bars! The first thing I noticed when I logged in was that my action bars were missing a ton of spells. I didn’t realize how much was being taken away until I saw the reality of it. So, the first hour or so, was just me remaking my action bars and re-choosing my talents. I was upset, intrigued, and excited by this change, because I now have five new play styles to relearn. But this also means that my Pally’s Selfless Healing is no more, and my Disc Priest’s Atonement is not the powerhouse it once was. But for a game such as WoW to go on, change is inevitable. After I managed my action bars, it was off to the barber shop for me for some plastic surgery. To put it bluntly and shortly, all my characters were wrong. My gnome seems to have gained an affinity to axe murdering and cats, while my draenei looks blank faced. My night elf seemed too harsh looking, but my undead was pretty spot on. Needless to say, this is all getting it’s own article! Next came the toys/reagents tab. Those changes are life savers, lemme tell you! Over one hundred spaces were freed on each character, and my bags are gloriously empty! (My only complaint; let jewelcrafting gems be allowed into those reagent tabs too please!) 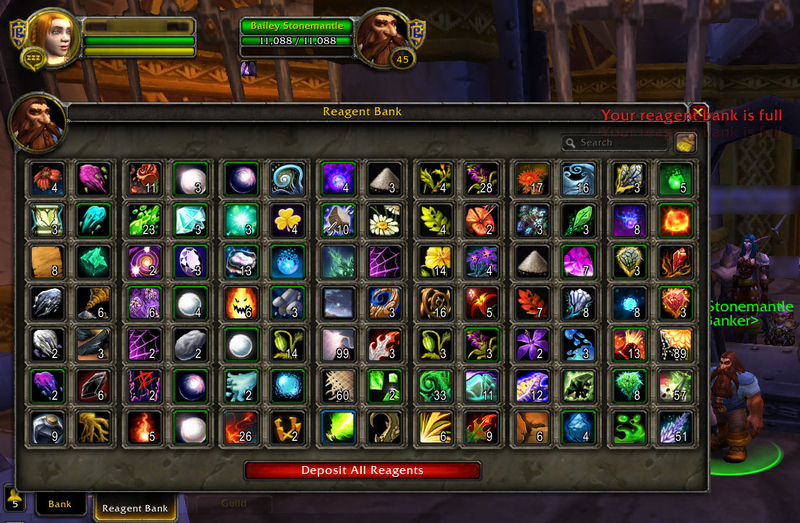 I actually managed to fill my reagents tab on my bank alt, so it looks like I will be doing some AHing. Speaking of AH, I’m liking the merging. I haven’t tried it out yet (due to the crazy fluctuating markets), but I’m liking the amount of stuff on it! I have a lot of junk, but I can’t get rid of it because I might need that!! So, for the most part, I really enjoyed the UI updates. They were much needed, and much appreciated. However… I don’t think the PvE scene was as successful. So. The LfA tool. It’s… uh… a good start? I’ve never used (or even seen OQ) so this is a completely unbiased view. I like that its only 25 groups per page, but I wish that you could page through instead of clicking refresh, so that you have the option to come back to groups you are tentative on. I do not like the HUGE filter that it has though. In my opinion, the raids should be broken down into more categories. For example, these should all be separate filters that groups can list under: SoO, ToT, HoF & ToeS, MSV, Open World Bosses, Others. That way, one can find their Ordos group much better instead of paging through hundreds of SoO groups. Also, I predicted this to an extent, but there is a bit of elitism. My lower ilvled characters never get accepted into anything (I literally spent an hour on my ilvl 528 resto druid trying to find a group that would take me), but my higher ilvled ones can get into any group. I’m not keen on this at all; there should be some incentive for bringing along those with lower ilvls. On top of this, I want to be able to whisper the group leader before I apply. There are times when I want more info on a certain group that I might not want to join, but I can’t just ask the leader to clarify. This one’s a much smaller pet peeve. I’m luke-warm on the whole LfA thing right now. I don’t personally see it as the most convenient method for pugging, but I know it will change a bunch before WoD drops, so again, not too worried. What does alarm me slightly is healing. I’ve tried out almost all my characters. 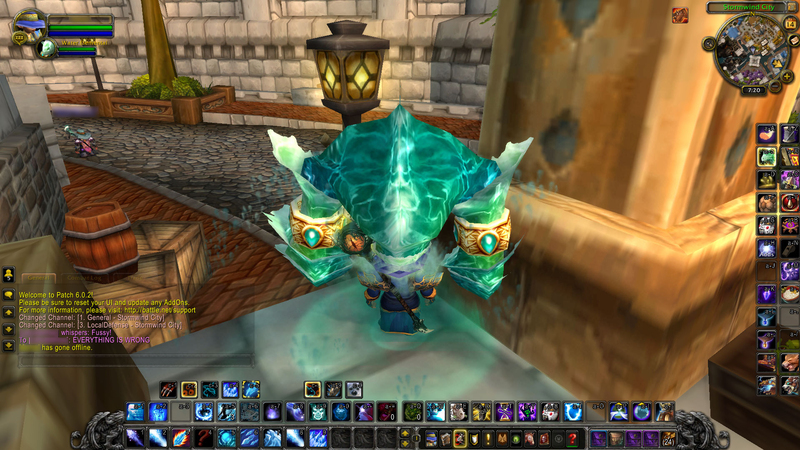 My mage felt very different without Alter Time, mage bomb, and Evocation, but I could definitely get used to her. There is a clear rhythm and logic to the game play and I like it. My 80 something Fury warrior is even more stoked, as I no longer feel rage starved or weak. Loving that! But what I’m not loving is healing. I’ve healed on both my disc priest and my holy pally, and neither felt right to me. In fact, healing on both felt distinctly wrong. My priest had no rhythm, no build up to it. To me it seemed spam Smite for Archangel, then spam Prayer of Healing until the Archangel runs, and Holy Nova whenever around people (by the way, Holy Nova is the bestest spell ever). Its boring, its only three spells, and it felt unfinished. All my big CD massive heals abilities are gone, and I feel lost without them. My paladin was even worse! The changes to SH made me far less mobile and less bursty, which was my favorite play style. Other than that, the class didn’t lose too much else, but I feel so weak! I can spam Divine Light (a long casting ‘big’ heal) all day, never run out of mana, and barely heal anyone. I was struggling to keep up in UBRS, a dungeon that I should be out gearing. I’m really not happy. My pally is going to get some massive talent changes soon, I can feel it. To put it in more general, less class specific terms, DPS seems overpowered (two shotting things I never could on my mage) and healing seems very very weak (barely able to keep up a tank while on my pally). Raiding seems harder because the heals just cannot keep up, but solo playing is easier than ever. Everyone is more turret-like, but the new encounter (UBRS) demands a pretty high amount of movement. Its all discombobulated!! Moving on to the pre expansion event itself; the Iron Horde Invasion. Better known as the Iron Horde House Visit or the Iron Horde Tea Party. All joking aside, this was my least favorite part of the patch. I’ve done the quest line once, and have no inclination to do it again. It was boring! The Iron Horde was a pushover; I could pull twenty of those guys and come out with more health than I started with. The quests were boring and uninspired. Kill guys. Kill spies. Poison ogres. Talk to king. This had the potential to the the most awesome atmospheric expansion event yet, but all it turned out to be was a short, boring, forgettable, and ultimately lame quest line. I had such high hopes, and I’m enough of a Blizzard fanboy that I would have settled for almost anything. But this? This was… lifeless. Lack luster. Stale. And the dungeon, eh it was ok. Some annoying mechanics (hello first boss dude), some nice perks (no corpse run! ), some nice loots (550 gear? Yeah, I’ll take it) but other than that, it was forgettable. And the fact that is just sort of ended with no explanation, yeah not so cool. I was unimpressed. There were no boss lines I remember, no cool gimmicks, and a pretty cliche and reused environment. I just… blah…. Long story short, I was underwhelmed by patch 6.0. The UI changes were great, but the story and the ‘pre expansion event’ were honestly lame. Maybe I’m being too critical, and please tell me if that’s the case, but I was not impressed. Yotaan: Okaaaay… My impressions are not quite as strong as the young Fussypants here. I honestly wasn’t expecting much with this pre expansion patch. I do remember fondly the Wrath pre expansion patch and that was tons of fun. I enjoyed the world wide interruption of the Scourge – it really felt epic (an overused word.) The two pre expansion patches since were not nearly as exciting. Additionally, enough people complained about the Wrath event that Blizzard was not going to repeat that scale of an event. So, I suppose I had lowered expectations. I actually liked the pre expansion patch intro quests. Sure, the quest line was a little short, but the story, at least on the Alliance side, was good. The dwarf lady seeking revenge on the ogre’s with poisoning! Not an expected storyline at all! My timeless gear only monk did have to be a little careful fighting the Iron Horde so I think it tuned for the boosted 90’s. The UBS dungeon was a great start but a poor finish. When I first ran it, I did not know when we ended. The 5 of us ran around to make sure we didn’t miss a boss. A little research was needed to confirm that was as far we could go. This needs to be made much more clear by Blizzard. As for the squish, UI changes, and ability changes, that’s really just part of game – it changes with every expansion. I like the changes every time because it becomes a new game again and I know that what we have now will be totally different as the expansion unfolds and my characters advance. So what did you guys think of the patch? Today, I shall tell you a tale. It is a tale of adventure, of perseverance, of patience, and eventually, of victory. In this tale, you shall find both the noblest of hearts and the rudest of trolls. For this is the tale of how I got my Ahead of the Curve Garrosh kill. The story starts as most do, with a villain and a problem. The villain clear but the problem harder to solve. Garrosh Hellscream, Warchief of the Horde, had to fall on Normal Difficulty but he had to fall soon. Very soon, as in within-a-few-months soon. But how could this happen? Now enters our protagonist, an earnest but under geared disc/shadow priest. Me. I made my goal to defeat Garrosh before the Great Patch Drop… but how? What follows is a three month long journey, leading up to the final showdown. The first step was gearing up. Weeks were spent gearing up in flex. This part was easiest. Groups formed quickly and often, and with flexible sizes, many could come along. I healed for the most part, occasionally dpsing, and all the while building up gear. Times were good, and people friendly. I developed a keen knowledge on the boss fights and my abilities. Then came the next step; normal raids. At first times were good. The raids were harder, yes, but not impossible. Success and gear flowed freely. Groups were friendly for the most part, and I felt pretty confident about my abilities. My item level rose, and I climbed higher into the normal raids. Then, the dark times fell. Patch Day was drawing closer, and people were becoming more desperate. Joining groups became much harder, as most were looking for carries not runs. People became more kick-happy and rude, and I often found myself the scapegoat. Impatience became the new norm, and generosity fell off the wayside. The tipping point came during a raid that could have ended it all. I had made it into a Garrosh Normal, and was clearing the trash with the group. I could tell right away that the other healer was far better geared than me, and I took it as a good omen. I might get this! We continued on, eventually getting to Garrosh. The first pull was… rough. Many people died to avoidable mechanics, and the tank foolishly perished to Iron Star. We rezzed up, and started again. Again, people were taking unnecessary damage. The other healer was blowing me out of the water, but even still we were struggling to keep up. A botched intermission later, and we wiped. This time however, blame had to be assigned. Fingers first pointed to the lowest dps, who were quickly kicked. Then, the blame turned to me. The other healer and the tank insulted me, as if I weren’t even there. I was called many things, among them a bad excuse of a healer and a person. And before I could speak a word, I was kicked. I was rattled. I was upset. I was put down. Confidence deeply shaken, I nonetheless queued right back up. But my heart wasn’t into it. I logged off, and the quest came to a halt. A week passed, and precious time slipped away. Still, I couldn’t bring myself to restart the quest. I didn’t want to go through that again. But a quest of such epic proportions couldn’t be ignored for so long. Within the next week, and good friend of mine told me that he had gotten his kill, and generously offered to pay for a carry for mine. I was motivated. Due to timing, I was unable to attend the carry (don’t worry, my friend didn’t pay, and I had planned to pay him back anyways), but I was dead set on getting a kill of my own. To Twitter I turned, pursing any and all opportunities. To Other Raids I returned, ruthless in my attempt to join any normals. To the blog I asked, writing up a few articles on the matter. First success came with Other Raids. I joined a group that was basically a carry. 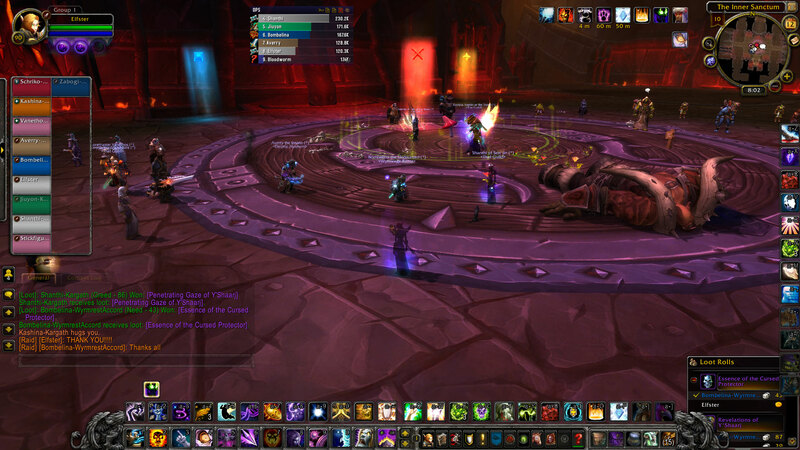 A heroically geared tank and a few dps pulled us from Nazgrim all the way to Paragons in an hour. I unfortunately had to leave, but now I had a valuable lockout. Next success came from Twitter. Several generous Twitter denizens offered to bring me along with their raids, and I beginning to feel more confident. I had two opportunities set. I was ready. The last success came from a commenter on the blog. Khizzara charitably offered her services as a Heroic geared resto druid. The offer was just too good to pass up, so as soon as I could I sent her an email. One of the Twitter raids fell through, but thankfully Khizzara was free and available to help. The details decided; Sunday night, Garrosh would fall. Khizzara, (who shall from this point forwards be known as the hero), was in a heroic raiding guild. This proved to be invaluable, as she was able to convince her raiding buddies to come along and help. Well geared tanks, heals and dps joined in, and among them a very special warrior. It turns out that Khizzara knew the one and only Garrosh Hellscream from Warchief Command Board. Yes, that one. The famous one. So, on top of getting to raid with heroic raiders, I got to talk to a celebrity in the WoW blogosphere. It was pretty freaking epic. Thanks to my valuable lockout, we jumped in right away on Paragons. The Klaxxi fell swiftly, and before long, we were working our way through the Garrosh trash. And then, within a half hour of starting time, we were there. At the doorstep of destiny. On the edge of glory. At the final battle of good and evil. As well geared as my allies were, we were all out of practice. Some mistakes were made, many silences were missed, and unfortunately many wipes were had. But every time, we picked our selves up, and went back at it. We would bring down Garrosh if it was the last thing we did. (and there was much rejoicing). And what is the moral of the tale you ask? Perseverance, my friends, perseverance. If you want something, you have to go get it. Everything requires work, otherwise it isn’t worth as much. I spent MONTHS training, gearing, attempting this kill, and it was absolutely worth it. Do I deserve it? Honestly, I’d say yes! I put in the effort, I kept with it, I tried my darnedest, and eventually I got it! But not without help! I want to give a HUGE HUGE HUGE thanks to these people! Without you, I could have never gotten this! I am eternally grateful to you guys for giving up a night to help me with this! You are the reason why I love this game, and why I continue to play. YOU GUYS ROCK! And all the folks from That Guild! I cannot express in words how thankful I am!! 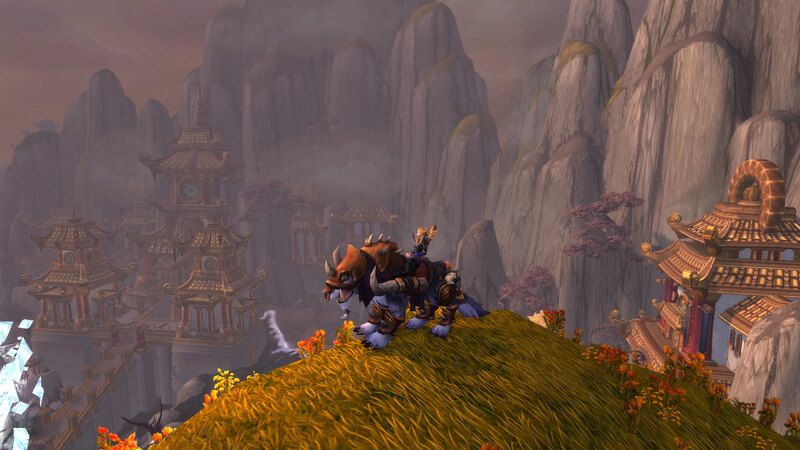 Mists of Pandaria goal achieved!! While skimming the list of things that will be removed upon 6.0, I was struck by how much would be gone come patch day. Ahead of the Curve SoO obviously, but something’s, like the Challenge Mode Transmog Armor? Why take content away, when leaving it will have no negative repercussions? An article by Tastes like Battle Chicken made me rethink my opinion. 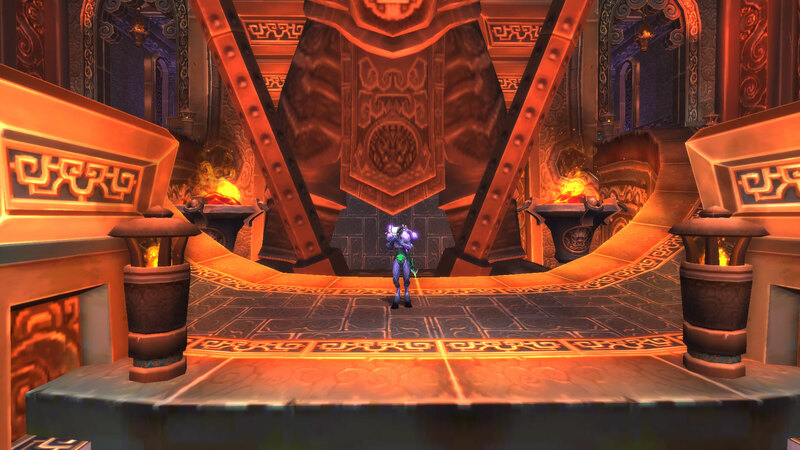 Ambermist talks more about the raiding and PvP achievements being removed, but her premise still applies. She explains eloquently why we shouldn’t feel entitled to achievements (I totally recommend checking out her post; it is a thought provoking and well written article). Do I feel entitled to achievements? Well yes and no. I agree with Ambermist’s premise, but I think the issue is more complex than a sense of entitlement. Ambermist defines an achievement as “a thing done successfully, typically by effort, courage, or skill.” That’s a great definition for the word achievement, but I don’t think it quite fits with what a WoW achievement is. A WoW achievement can be more or less than that. Definitely, for the heroic raiding, and the pvp, that fits. But for things like The Old Gnome and the Sea I don’t really think that definition applies. 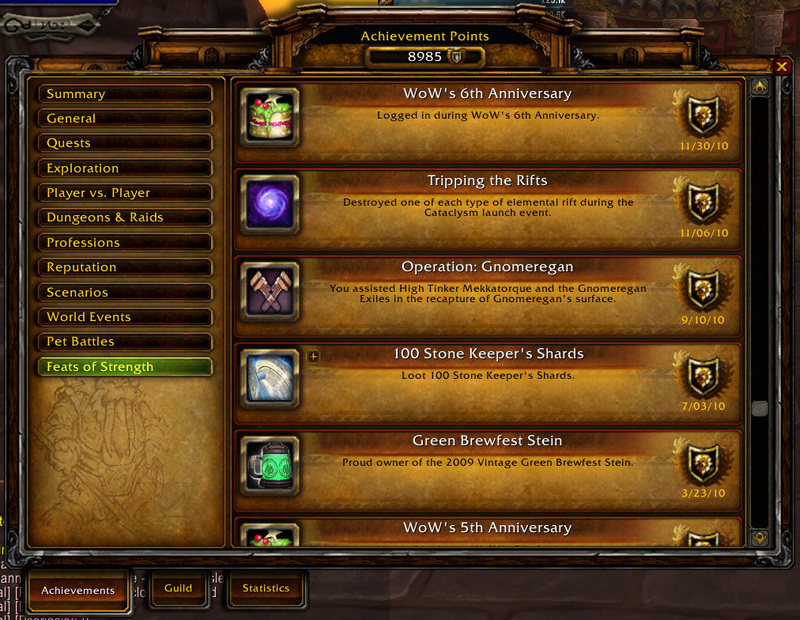 I would define WoW achievements as like collecting Pokémon cards. Some are rare or hard to get. And some are like Pikachu, incredibly common and easy to get. On top of this, achievements don’t really tell the whole tale. Some really hard to get achievements you can stumble on to, while other take you weeks and weeks and weeks. I’ve gotten some rare kill achievements by blind luck, but have spent almost 2 months now trying to get Ahead of the Curve for normal SoO. The effort required for every achievement differs, which is what makes this question so hard to answer. Do I feel entitled to achievements? On one hand, not at all! I have a chance at getting some of them, but that’s it. I’m not owed anything, and my own satisfaction should suffice as my own reward. But on the other hand, I do feel entitled to some achievements. I want that Normal Garrosh kill. I’ve invested hours on it, wiped countless times, joined multiple groups. So at this point yes, I do feel a bit entitled to it. I’ve put the work and sweat into it, now I want to reap the rewards. But at the same time, I know that if I don’t get that Normal Garrosh kill by next Tuesday, then it’s over. I don’t deserve to get more chances at it; I’ve had just as long as anyone else. I understand that it wouldn’t be fair for people to, several expansions later, get that achievement after so many people broke their backs on it when it was current. I understand this. On the achievement front, I understand both sides of the argument, and can sympathize with either. But, do we consider content the same as achievements? Achievements is just a name with a time stamp on it, but actual content is slightly different. After the AotC achievement goes away, the raid will still be there. Yes, the mount and the title will disappear, but everything else will stay the same. So what about Challenge Modes? The entirety of those Challenge Modes are leaving; the dungeons, the gear, the mounts, the titles, the achievements, everything. Or the treasure room on the Isle of Thunder? Does the same rules apply? I think not. Achievements and titles, yes, should go away. But the content itself should stay. The treasure room should stay, but just have its money amount reduced slightly. Challenge Modes and the gear should stay, but only be attemptable at level 90 (similar to the Herald of the Titans Achievement). Taking away content for the sole purpose of making those who got it seem special is silly. And a waste of resources. Getting achievements can feel like an accomplishment, and that sense of accomplishment is often increased by the unavailability of that achievement later. But content does not and should not follow that rule. Achievements can only be completed one way; the way described by the achievement itself. But content can be completed in any way one would like, the normal way, the blow-through-everything-because-I-outlevel-this way, the I’m-going-to-take-off-my-armor-to-make-this-difficult way, any way you’d like. And removing the content entirely is foolish and unfair. Achievements can be the special snowflake ‘I did this when it was hard’ thing, but content should be completely by anyone at any time. And one last thought: Does an achievement really portray the ‘accomplishment’? Or just the numbers? But seriously though, gimme that AotC!